Over the past couple of years, I have become obsessed with oils. I've always been wary about them—having combination skin will do that—but I've slowly integrated them into my skincare routine and I have no regrets. If you have dry skin, oils are a quick and easy way to get instant hydration (especially during the winter months). If you’re like me and you have combination skin (i.e. dry cheeks/chin/temple but oil t-zone), just be more specific in ... the extra oil can really make my skin act up. Kiehl’s Midnight Recovery Concentrate - This overnight oil leaves my skin feeling soft and refreshed. You'll only need couple drops of this stuff, so this bottle will last forever. Olay Regenerist Luminous Facial Oil Daily Treatment* - This is the only oil on my list that is recommended for day and night use, but I just stick to the latter. Another good oil to boost hydration. I love the airy formulation that sinks easily and quickly into the skin. The Body Shop Vitamin E Overnight Serum-in-Oil - This oil is probably my favourite. It is chock-full of plant oils and vitamin E. It feels soothing on the skin and clears up any dry patches instantly. Caudalie Polyphenol Overnight Detox Oil - I don't know about the "detox" properties of this oil (it really doesn't clear up the skin like a good ol' AHA product will), but the concentrated formulation of antioxidants helps brighten and hydrate the complexion. 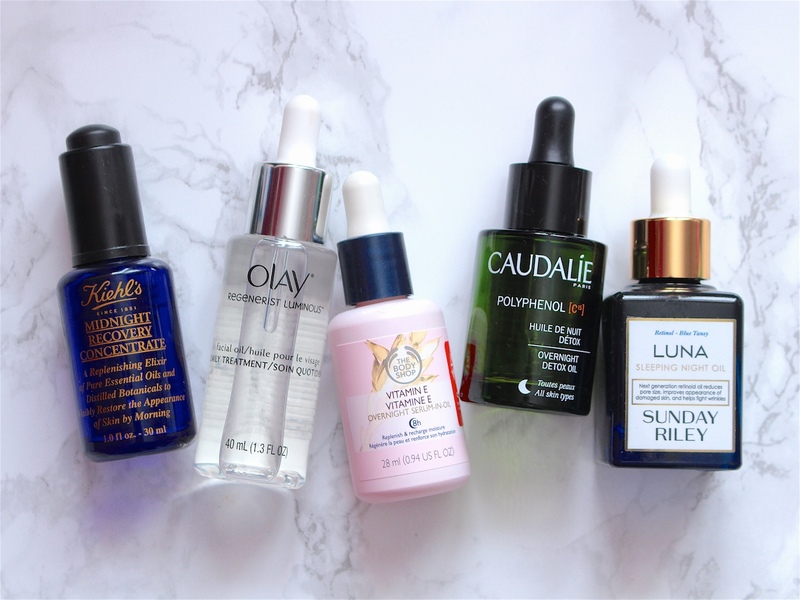 Sunday Riley Luna Sleeping Night Oil - While I do like this, I don't think that it's a miracle-worker and I definitely don't think it is worth the price tag. It has a complex combination of chia, avocado, grape seed, blackberry and trans-retinol esther (I still prefer traditional retinol). I do like how it feels on the skin and I did notice a subtle improvement in my skin after the first few weeks of use. I will enjoy it while I have it, but it is not likely something I would repurchase in the foreseeable future. I am pretty excited about the brand, Sunday Riley, though. I'm looking forward to trying other products once I've finished this luxe bottle up (specifically the Juno Hydroactive Cellular Face Oil). It's important to note that most of the oils I mentioned have a fragrance. I have not had any issues / irritation with any of them, but keep that in mind in case you have sensitive skin. Have you incorporated oils into your skincare routine? Let me know what your favourite is. (*) This post contains products sent to Stylish & Literate for editorial consideration. Read disclosure here.